It could be a new career opportunity, health goal or becoming a better parent. No matter what you are wanting to achieve, asking the right questions is key to achieving your goals + improving your life. No matter what questions we ask ourselves we will get an answer. And if you’re asking questions like, What’s wrong with me? it will probably be an answer that will send you on a downward spiral of asking more unhealthy questions. With questions like these to guide your thoughts, it won’t be long until you feel unmotivated, defeated + ready to quit. Answers like these will not improve the quality of your life. The key to finding the right answers, the ones that you are looking for to achieve your goals, is to ask yourself the right questions. We are all leaders of our own lives. And to lead yourself well + to improve the quality of your life you need to ask yourself better questions. So what kind of questions should be asking? I’m glad you asked. 1. What is the one thing I can do today that would have impact on what’s important to me? This is a great question when you are feeling overwhelmed with what is before you. Instead of going into a scramble, take a moment and ask yourself this question. Or as Greg McKean says in his book Essentialism, “What is the one thing I can do that will make everything else easier?” I use this question to help me determine the next step, and the next series of steps to reach my goal. 2. How can I improve, or contribute, today? One of our four main needs is progress. and this question empowers you to discover what action you can take to make progress in your life. 3. What would make tomorrow better than today? I enjoy journalling this question at the end of my day. Taking a few minutes to review your day can save you from going around + around the mountain. Yes, it can be difficult to dig into your failures. Remember, failure is just feedback. Take a look + learn from it. 4. What is most effective way to achieve your desired result? Before diving into action, take a moment to consider the possibility of other options to achieve your goal. Ask yourself, “What is another way I could do this?” You just may discover something better and save yourself a lot of time + frustration. 5. What is the lesson or takeaway? Hindsight is 20/20, meaning looking back we can see more clearly than when we were going through. Use this to your advantage + take a moment to reflect on what happened. A lesson learned is wisdom gained (my quote). Wisdom is applied learning, and way more valuable than gold. This is a great question for insight into your blindspots. You may also find it helpful to ask a trusted friend this question to help you find the answers. 7. Who can I connect with? No man is an island, or woman. And life is better when we do it together. So whether it’s work, parenting or friendships, reach out + connect with someone. 8. Who do I need to be today? As I mentioned earlier, progress is one of our four main needs. You can’t make progress if you don’t grow. To reach that goal or take that new opportunity, ask yourself what kind of person you need to be to make it happen, instead of limiting yourself by what you think you can do. By focusing on who you need to be you can kick fear to the back seat and quieten the doubting voices in your mind. We are capable of far more than we realise. We listen to ourselves. Your brains is wired to help you make decisions that are in line with what you believe. 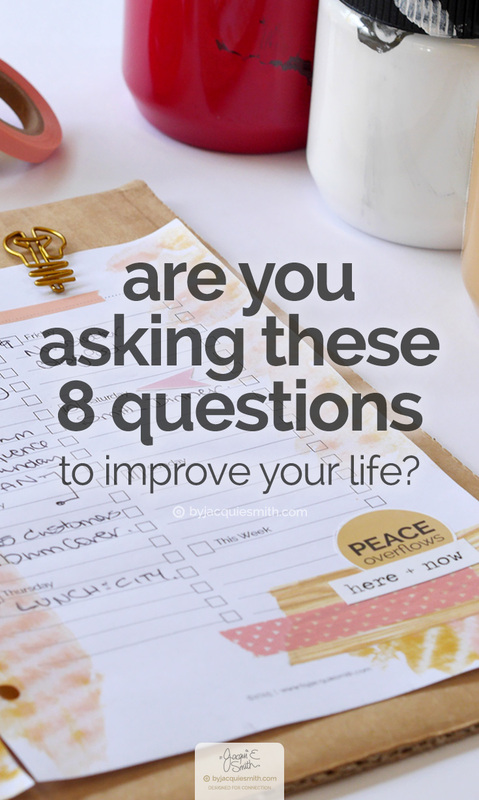 So it’s important you ask yourself better questions, to get the right answers that will shape your thoughts + help you take action to live a better life.